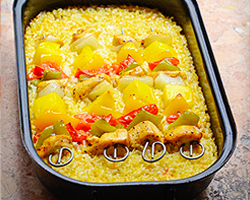 Cider Chicken and Rice Bake – taste autumn in this simple yet flavorful apple cider weeknight casserole. 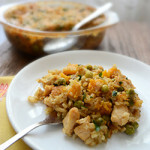 Casseroles never go out of style when you need an easy chicken dinner, as it is a dish that practically cooks itself. We use seasonal flavors to make them more interesting. 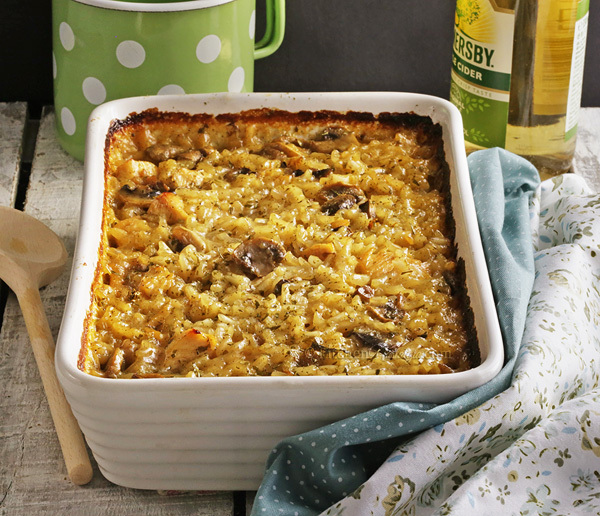 This time apple cider and cremini mushrooms make it taste like autumn while yellow mustard and herbs make it even more aromatic. 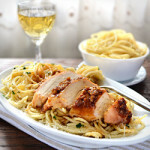 Any type of de-boned chicken meat will be fine used in this recipe, white or dark. You can cut it into small cubes or leave pieces of meat larger. I used my favorite Arborio type of rice which releases starch and creates an incredibly creamy dish, similar to risotto, without the need to stir it on stovetop. It also makes a dish lighter and healthier because no actual cream is used. 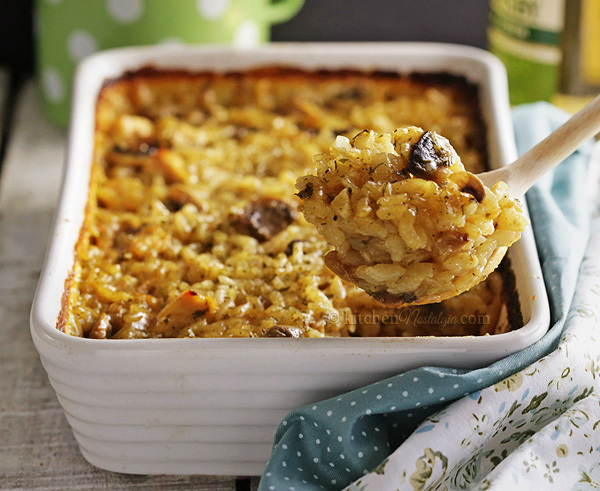 Cider Chicken and Rice Bake is a perfect meal for busy weekday dinners. 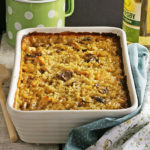 Cider Chicken and Rice Bake - taste autumn in this simple yet flavorful apple cider weeknight casserole. Fry chicken in olive oil until golden. Remove from the pan. In the same pan, fry onion until translucent. Add garlic and cider. In a small bowl, mix flour with broth or water and add to the pan. Cook stirring until mixture boils and thickens. 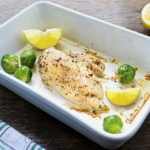 Return chicken to the pan together with all remaining ingredients. 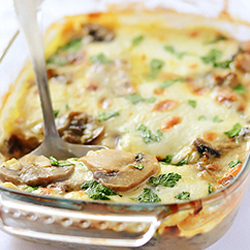 Transfer the mixture to an oiled casserole dish and cover it with aluminum foil. Bake for 50 minutes in 375 F (190 C) preheated oven. Uncover and bake for 20 more minutes or until rice is cooked through. Hello: Sorry to tell you that 500 grams are equal to l pound because 1000 grams are equal to 2.2 pounds. Maybe you would like to correct the error in the ingredient list for the recipe since 1/2 a pound would be equal to 250 grams. Thank you. Yes, thanks. I used about a half of the 500 g package of meat and converted measures into pounds, but forgot to correct the grams. This sounds wonderful. I will be making this on Sunday. Thank you for the recipe! How is butternut squash used. No mention of it. Hello: Thank you for answering my comment about the amount of chicken used in the recipe. 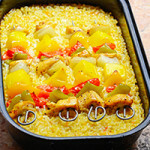 Now, I have a question about “Cider Chicken and Rice Bake”. Is there a way to substitute the “Cider” for something else? 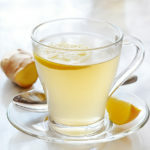 I really would like to try this recipe but cannot get the “Apple Cider” in this country. I wanted to make this for my daughter’s birthday on October 25 but first, my oven stopped working and then I could not get the “Apple Cider”. The recipe sounds enticing, but I do not know what would be right to use and not lose the exciting flavour! My oven will be fixed this week, so I would like to know what could be used instead and still obtain that delicious taste. I hope that you will be able to answer my question soon. Thank you for sharing. Jean Gordon. Since apple cider I used tastes like apple juice that turned into wine, if I were you I would use mixture of unsweetened apple juice and white wine. If you don’t want to use alcohol, you could combine apple juice with a little bit of lemon juice or apple vinegar. 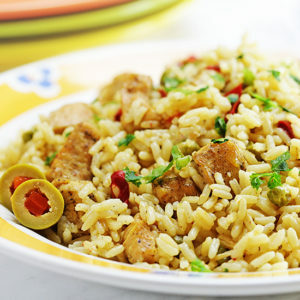 Hi this recipe looks amazing and I can’t wait to try it! I have a question though- you mention that there’s yellow mustard in it, but it’s not listed in the ingredients or in the actual recipe? You’re right, I forgot to list it. Add 1 tsp yellow mustard in Step 4. How many servings for this recipe? I need to prepare for 8.